Compiled by John R. Ketteringham, MBE, PhD. The death of Rodney Meadows from a heart attack in the early hours of Friday 15th March 2002, at the age of 77, came as a shock to all who knew him, not least to his fellow officers of the Ancient Society of College Youths, with whom he had been dining only a few hours earlier. As a tribute to Rodney I have reproduced below articles written by him in a series entitled Belfrymanship. I have followed these articles with The Great Debunker as a further example of Rodneys talent. "The phrase 'A Scholar and a Gentleman ' is overused, and often misused, but for Rodney; the epithet is wholly apposite. Rodney was an intensely private person, and it is only now that the many facets of his life are coming together. Even so, he was very sociable and always excellent company. He had a splendid subtle wit, which he used to great effect, but never maliciously. He was a perfectionist to himself, and would only take on activities or responsibilities if he believed he could do them well. What he did take on, however, he carried out with passion and loyalty, and with a competence to which many of us can only aspire. His manner was charming and unassuming, yet he commanded the respect of all who knew him. He was a scholar of some distinction. From school he won an open scholarship to read classics at Exeter College, Oxford, and, after graduating, completed a post-graduate Diploma in Classical Archaeology. He continued his interest in this field, and in particular, Roman Britain. He had a number of papers on the subject published, although his last remained unpublished. It has been suggested that the reason for non-publication was that it ran contrary to received wisdom. He was not averse to controversy, indeed at times revelled in it. He was always prepared deliberately to take a contrarian view (often with a twinkle in his eye) simply to test the intellectual rigour of the principal argument. After Oxford, he joined the Western Region of British Rail as a 'Traffic Apprentice', the management training scheme of the day. This allowed him to indulge in his passion for railways -it also took him to a number of parts of the country. He rose quietly through the ranks, changing region in the process, ending up based at Kings Cross, first as Divisional Passenger Manager and latterly as Marketing Manager for the East Coast Main Line. It is said that he had the capacity to rise further within British Rail -He chose not to. Stories of his working life abound: his attention to detail; his knowledge of, and passion for railways; his ability to communicate effectively at all levels, from the man on the footplate to the Board. It is said, however, that his first task in the office every morning was to speak to his stockbroker! Outside his scholarship and his work he had many and varied interests. He was a keen Bridge player, and, having been introduced to golf in 1971 by his good friend Ralph Edwards, became a keen and competent golfer playing many of the major courses in the British Isles, particularly in Scotland and Ireland. It was during his regular visits to Southern Ireland that he indulged his hobby of horse-riding. He was also a keen football fan. Highbury may seem an unlikely place to find Rodney, but he was a lifetime supporter of Arsenal, a season-ticket holder, and indeed a shareholder. Today he would be happy  Arsenal two points clear at the top of the Premiership, and with a game in hand! Rodney was a lifelong enthusiast of British music and particularly the compositions of Frederick Delius and Arnold Bax. In 1962, he became a founder member of The Delius Society, which was established to promote public education in, and the appreciation of, the music of Frederick Delius and his contemporaries. He was elected Society Chairman in 1971 and his wise and experienced guidance enabled the Society to grow from relatively small beginnings into the influential body it is today, with over 500 members world-wide and many branches at home and abroad. He retired in 1994 after an unprecedented 23 years service and, after delivering the Annual Fenby Lecture at the 1995 Delius Festival in Jacksonville, Florida, he was appointed a Life Honorary Vice President of the Society. In his last months, he was still actively assisting the Committee to revise the Society's constitution, on which he was an acknowledged expert. Rodney was also generous in the encouragement of young musicians. He financed the early Wigmore Hall recitals by Tasmin Little, which launched her international career. He also promoted the performance and recording of British classical music. It was, however, from his Church Bell Ringing that many will know him. 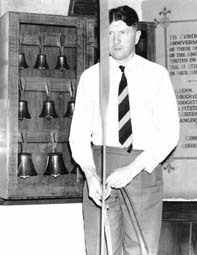 He was introduced to ringing as an undergraduate at Oxford and became an active member of the Oxford University Society of Change Ringers. His enthusiasm was such that he also joined the band at the tower nearest to his parents then home, St Augustine's Kilburn. Apart from the inevitable breaks while working away from London he remained a loyal supporter of that band until his death, a period of over 50 years. Early in his railway career he was posted to Snow Hill Station in Birmingham, and became a much respected member of the leading bands at St Philip's Cathedral and at St Martin's-in-the-Bullring. 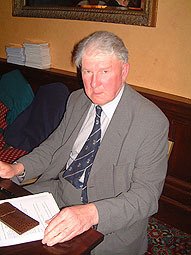 He was elected a member of the Ancient Society of College youths in 1953, and, back in London in the late 1950s, he became an active supporter of the Society in London. He was elected Master in 1964, and was a Trustee of the Society for the last five years of his life. It was in that capacity that he attended a dinner for the Officers of the Society on the night before he died, an event which he clearly thoroughly enjoyed and to which he contributed in his own inimitable style. He was a supernumerary member of the St Paul's Cathedral Guild from 1971-1984. His links with the Oxford University Society of Change Ringers were also maintained and he served as President from 1976-1982. But his spiritual ringing home was Westminster Abbey. A supernumerary in 1959, and a Principal Member two years later, he gave over 40 years service to the Abbey, including ten years as Secretary of the Abbey Company of Ringers. He loved the place, and was much loved by all involved with it. He rang for many great occasions, and how fitting that his body should have been received into the Abbey on the same day as that of HM Queen Elizabeth, the Queen Mother, and, that after the pomp and splendour of the State Occasion there should be a simple service for Rodney, and that the bells should be rung for him! In ringing circles, however, he will be remembered not just as one of the most quietly competent ringers of his day, but perhaps most as a wonderful social companion, and as a brilliant and witty writer and speaker. His adaptation of Stephen Potter's 'Gamesmanship' to ringing in his 1951/2 articles entitled Belfrymanship are classics, as was his speech at the Henry Johnson Dinner in Birmingham in 1961 when he wittily described the leading Birmingham ringers of the day in verse - 'The Great Debunker'. Some took offence at his Belfrymanship articles. A 'Disgusted of Tunbridge Wells' correspondent wrote "...but to the creator of Meadowsmanship -keep your devilish art off ringing, return it to the home it doubtless has in Hades with the Friars of The Summoner's Tale." But for most, they were witty, they were amusing, and they were extremely perceptive! Rodney was a man of many parts. Although he remained a bachelor all his life, he was a strong family man. He was devoted to his parents, Harry and Lois, and his elder sister, Jean, and was a regular attender at the biennial reunion of the wider family of cousins. He was kind and generous, a good friend and wise counsel. He was indeed a true Gentleman. His final article on Belfrymanship included the comment "... That's what I like about being a ringer. It's not only the ringing itself, it's the comradeship". He was right - and he gave so much to both. He will be sorely missed." It is a sad fact that, all too often in life, we never fully appreciate the true value of any human relationship until it is abruptly taken from us and this is certainly true in the case of Rodney; for many of us remember with gratitude, the enormous and very generous contribution that this quiet and private man made to The Delius Society over very many years. It is only in the last few days that many Society members, who thought that they knew him well, have been surprised to discover what a wide spectrum his interests and influences covered. Distinguished Oxonian and Past Master of the Ancient Society of College Youths, skilled horseman, devoted and munificent Arsenal Football Club supporter, low handicap golfer, accomplished campanologist and senior member of the Westminster Abbey bell ringing team. One of his close friends, a Society member, who recently accompanied Rodney to a concert at the Abbey, told me that to stroll through the cloisters of that historic building with him, was akin to walking with a distinguished cleric, for everyone seemed to know him; from the Dean to the church cleaner and all paid him due respect and deference. Despite his rather dignified and scholarly image, Rodney had an engaging sense of humour and some delightful idiosyncrasies. His passion for Mars bars was legendary and he never travelled to concerts without a seemingly inexhaustible supply. He was also a great enthusiast and expert on steam locomotion and the national railway system. It was at a lunch last year, when he discovered that my wife and I had purchased a holiday home in East Devon, that he caused great amusement by launching (whether we all liked it or not) into a detailed explanation of the structure and operation of the Seaton Junction to Axmouth tramway. In this connection, many of his Committee colleagues in the early days will also have fond memories of the meetings that, as a senior officer for British Railways, he was able to host in his offices at the old Great Northern Hotel at Kings Cross. Of course, music had always been a great influence in his life and although he was devoted - and particularly knowledgeable about the works of the British composers Arnold Bax, Edmund Rubbra, Frederick Delius and his contemporaries, he was equally enthusiastic about a number of lesser-known Russian composers - Balakirev, Glazounov and Scriabin - as many of his writings and presentations to the Society demonstrated. It was indeed unusual to attend one of his talks without getting the opportunity to hear for the first time the recording of a rare and unusual treasure from their repertoire. When, some years ago, he became concerned that recording and concert companies were giving insufficient attention to the compositions of Arnold Bax, with no more ado, he joined up with the composer Francis Routh, and financed their own concert and recording company - Redcliffe Recordings. When Dr Roland Gibson founded The Delius Society in 1962, Rodney was one of its first members. He was elected Chairman in 1971 and his wise and experienced guidance enabled the Society to grow from relatively small beginnings into the influential body it is today. During his many years at the helm, the co-operative liaison that he developed with The Delius Trust and his close friendship with Dr Eric Fenby undoubtedly enabled the Society to enhance the memory and public awareness of the music of Delius. Rodney stood down as Chairman in 1994, following an unprecedented twenty-three years service and, after delivering the Annual Fenby Lecture at the 1995 Delius Festival in, Florida, he was appointed an Honorary Vice President of the Society. It can be justifiably claimed that few members have made a greater contribution to the Societys development and success - and only those closest to him ever knew the scale of his generosity in financially supporting our musical activities; a fact which he tried so hard to cloak in anonymity. In his last months, he was still actively assisting the Committee to revise the Societys constitution, on which he was an acknowledged expert and he was to have played a central role in our Fortieth Anniversary celebrations. Rodney will be very sadly missed, and most of all, he will be remembered with great respect and affection. I speak for all Society members in offering our heartfelt sympathy to Delia, Tony and all Rodneys family in their loss. Let me finish by quoting from an email I was given as I arrived at the church. It is from John Luther, one of Rodneys American friends from Oceanside, California. He ends his message "He was a gentle, sensitive and gracious man  Thank you Rodney  I will miss you". And so will we all. In his own tribute Richard Kitching mentions the amusement which Rodneys talk entitled 50 years of Iconoclasm caused. Yet Rodney was something of an iconoclast himself. During a long friendship we enjoyed many a session debunking cherished beliefs, and he became more insistent as the years went by. His belief in his memory of events was totally secure: if he said Adrian Boult grouped all his violins on his left in the pre-1939 BBC Symphony Orchestra then that was a fact and I could produce as many photographs showing the seconds seated on Boults right as I liked, he would not be moved. Often he argued for the sake of it: once, in Jacksonville, when he was doggedly maintaining that the cor anglais theme in Appalachia was actually played by the oboe, I said to him in exasperation: "Rodney, you are the most stubborn man I know." A broad smile spread over his face, as if the small boy that undoubtedly also existed within him had triumphed. We first made each others acquaintance at the 1962 Bradford Festival. I was at the scores table avidly examining works Id never seen before when a voice said: "Are you interested in Delius then?" I think he was already convinced that there was going to be a Delius Society, and was consciously touting for members. We both attended the founding meeting and, when the Society was announced, he came down to my home in Wales to try to persuade me to join the committee. I couldnt then, and when I eventually did I found him presiding over a body in some disarray, beset by the kind of problems that often do affect bodies with strong-willed people running them. I was full of admiration for the patience he showed at this period, when a number of years went by without a great deal of progress to show for them. At committee meetings, if the atmosphere was particularly tense he would be at his most vigilant, though I discovered that a suggestion could often be effective if conveyed in a not-too-serious way. On one occasion I suggested that we needed a new letterhead. At once he looked startled  after all, this was change and, on the whole, Rodney hated change  but when I argued that our present stuff seemed to date back to when Delius was alive he began to laugh, and the matter was soon settled. Gradually, the skies cleared and the Society he handed over to me in 1994 was in every sense a going concern. Rodney was that typically reserved type of Englishman, disinclined to talk about himself and quite unable to imagine why anybody would be interested anyway. As it happens, in his case there was a great deal to talk about, as we now know from the tributes paid to him from many quarters. From scholar to bell-ringer, horse-rider to golfer and bridge-player, and from a devotion to football exceeded only by his devotion to music he was a man of many compartments, each one of consequence, each one attended to meticulously and, where appropriate, with passion. I once described Roland Gibson as a master of the short letter, and Rodney was another. Never was a word wasted: his last to me ran to just 58, in which he conveyed his thanks for the hospitality I had provided, commented pertinently on Simon Rattles placing of the double-basses in the concert wed attended, approved a scheme we had discussed over dinner and ended: Reached home by 11.45pm. Excellent evening out. Rodney had his own, sometimes eccentric, means of doing things and a way of using language that was tremendously endearing. In the very earliest days, when my wife and I happened to be in London at a weekend, it occurred to me to introduce them. I hadnt realised that you didnt visit unannounced. He was then in a sparse bachelor flat in Paddington, and our mid-afternoon arrival threw him into complete disarray. "Ive nothing for tea," he protested; then, brightening, added a line that has remained with us ever since: "Wait a minute. Ive got a Swiss roll we could get stuck into." Occasionally Arsenal would play in or near Birmingham, or he would be bell-ringing at St Martins-in-the-Bull Ring; then might come the telephone call that began: "Is there a dish of tea available?" We were occasionally allowed to drive him about. Ostensibly, these trips were to explore the leafy lanes of Warwickshire (his expression), but in reality we were on the trail of unusual railway tickets for his collection. We would sit outside forgotten halts such as Danzey-for-Tanworth while he investigated. "Success?" I would enquire as he returned. "Oh, some real little treasures", was usually the laconic reply; and off we would go to the next. The myriad pleasures that our shared love for Deliuss music afforded us, of course, cannot possibly be enumerated, but I am well aware that my own 40 years of enrichment through The Delius Society have been further enriched through knowing Rodney. I might paraphrase his own comment about the joys of being a bell-ringer, Its not only the ringing itself, its the comradeship; substitute the Society for ringing and youve got how I feel about Rodney Meadows, my oldest friend. I joined the Society in August 1963, and was soon introduced at early meetings to most of the members by Estelle Palmley. Among those I met was Rodney Meadows, who was not then Chairman but a member of the Committee. I soon struck up a friendship with this gentlemanly and apparently retiring man, and in the following April he wrote to me for my comments on the draft Constitution of the Society upon which he was then working. I thought this was quite an honour for a new member. After I had formed the Midlands Branch, he made a special effort to come to one of our early meetings and was instrumental in putting me in touch with Peter Thorp, who is still a member of the Society. As early as 12 November 1964 I received a letter from Estelle to say that Rodney had raised the question at a Committee meeting of giving the Midlands Branch financial support or other practical help. I replied that the greatest help would be if speakers could be found to talk to us. This Rodney arranged, and as early as November 1965 he wrote to say that the conductor Stanford Robinson would be prepared to come. This was a great honour for the Branch, and an even greater honour came later when Rodney was instrumental in persuading Eric Fenby to come. Rodney himself came on several occasions to give talks, firstly on one of his great loves, A Village Romeo and Juliet. In those days the only recording was Beechams on 78s, which Rodney used for illustration. His last talk to us was as recently as 20 October 2001: its title was 50 years of iconoclasm, caused many of us to rush for our dictionaries! Following this visit, I was astonished to hear that he intended to donate �500 specifically for the Midlands Branch, "to be spent at the absolute discretion of the Branch Chairman". This was typical of Rodneys kindness and practical generosity. After meetings in the Midlands, Rodney liked to come back to my home for "Whisky and Bax" - not Delius, please note. Actually, we often had some Russian music besides Bax, such as Gli�re or Glazounov - he was very knowledgeable about Russian music. These sessions have been known to go on until 4 am! As members will remember, Rodney was not an early riser, and one can see why. Any phone call to him before 11 am was not popular. The Society, and the Midlands Branch in particular, has lost a friend who supported us for (in the case of the main Society) over forty years, and who will be greatly missed. I shall certainly miss "Whisky and Bax"! From The Ringing World of 23rd February 1951. Belfrymanship is defined as the Art of being "Top Man" in the belfry. There are "rabbits" in every tower; you need never be one of them. In fact, as a belfryman, you should seldom fail to inspire awe and respect whenever you cross the threshold. In introducing this subject I gladly acknowledge the pioneer work of S. Potter in the allied spheres of Lifemanship and Gamesmanship, and wish to explain that to compress so vast a subject as Belfrymanship into this small compass forces me at the moment to confine this article to what are little more than random jottings. "What would you like to ring?" "Dont let me upset the routine. Ill just fill in"
"Well, if you dont mind my saying so, you are the least good, of those here tonight, so we had better fit in with you, hadnt we?" Though even this drastic cutting of the knot was not the end of the matter. The visitor promptly asked for Cambridge Major, and the locals found that they did not have a band. But fortune is not always so genial when it comes to regaining the initiative. When selecting your bell, choose a large rather than a small one. There is a theory that little bells must "ring round" big ones. This means in practice that the little ones are, in the absence of any obvious cause, blamed for indifferent striking. Always be on the lookout for the faults of others. You can, of course, become a Hisser. The disease is catching. One big Hisser in a band breeds several little hissers. It is a form of self-defence, the non-hissers being, as it were by definition, hissed at. When everybody hisses the ringing will no doubt reach an acme of perfection. But then there will presumably be no need to hiss. The belfryman requires a better weapon. More subtle is the gesture of stretching out the arm and hand horizontally and making slight but majestic waves upwards or downwards. This indicates to the person at whom you gesticulate that there are slight but distinct imperfections in his striking, audible and painful to you (but not to him), which he will please adjust at once. The downward motion is the more effective, suggesting, as it does, the patting of a tolerated but misguided dog. The victim has no redress. He is probably having trouble with his bell anyway, and to retaliate by imitating the gesture will be fatal or, at best futile. He can only try next time to lure his tormenter onto a difficult bell and pray that the rope will slip wheel. Good striking is a matter of cohesion and mutual confidence within the band. Personalities do not dominate good striking, but only in the mess-ups. So, when the ringing becomes at all shaky, hasten the process by rasping, in the most vinegary tone you can muster, "watch your striking". This commits you to nothing and can be devastating. I am thinking of trying it out on the dance floor, when things are not going well: "Watch your dancing, dear". When asked to call a touch, remember that you thereby become ex-officio "Top Man". All that is necessary is to preserve the status quo. A novice of Belfrymanship (and of conducting) once called a bob in Stedman Caters while in 4-5 and made it there himself. The ringing fired its way to a standstill, and in the ensuing discussion, the novice found two culprits and argued them into accepting the blame - and in all innocence too. Poor conducting this, but good Belfrymanship. It was myself, anyway. Sometimes it does pay to show the white flag. This can bring enormous dividends. A sharp dispute between two members of a North Country Association over an unsuccessful touch of Double Norwich, that seemed likely to end, if not in blows, at any rate in refusal to ring together again, was once sweetly resolved by a lady member of the band, well versed in Belfrymanship, who confessed that it was all her fault. The response was electric. By the end of the evening one had asked her to stand in a peal, the other was taking her out to dinner. One final hint on the practical aspect of Belfrymanship: close your eyes intently when dodging or assume the air of one whose attention encompasses place-making, dodging, leading and, in fact, all the bells work at once. This gives your dodging partners the humble feeling of being interviewed in an outer office on a matter of minor importance. They will then meekly accept the blame for any clashes. but just give me a good-going six-bell tower and some enthusiastic learners and I am quite content teaching them plain hunting". These tactics succeed only against feeble or exhausted opposition. Several replies are available, the following being reasonably terse: "You did say enthusiastic, didnt you? No, the belfryman should not fight shy of theoretical discussion. Learn up the technical terms. Import "Q Sets" into the conversation whenever a depth charge is called for. Casual mention of "In Course Singles," too, can often freeze a promising discussion among weaker brethren and leave you with the field free to air your own pet views. The use of "Grid Analysis" for this purpose is not recommended. You may be asked to enlarge upon it, and lucidity is not the most effective means of being impressive. You are trying to clear the stage, not to clear the discussion. And now as letters to The Ringing World so incongruously conclude, good wishes to all. And may you go on making unnecessary enemies. "If I dont watch myself, I shall be turning up in the next Belfryman article." "Well, as a matter of fact, you were in the last one." Clearly the last word has not been said. In the Potter spirit, therefore, though with inadequate mastery of the Potter patter, these supplementary notes are offered. The distinction between a belfryman and a conductor is not always clear. A genuine conductor has no need to be a belfryman; and few are. But circumstances, too, affect the issue. Kreneckes formula, embodying the most recent research, proves true for most values and may serve as a provisional guide: R being the ability of the person concerned to put the others right, T his tendency to go wrong himself, S the coefficient of friction among the ringers and N the number of bells on which changes are being rung (R, S and T being measured by a device known as the Initometer and expressed in Isospasms where (S + T)2  2R divided by 13-N yields a result of 4.25 or more, we have a belfryman; where below 4.25, a conductor. From this there emerge two interesting corollaries: (a) That a belfryman will be relatively more common on the higher number of bells; (b) That a conductor in one tower may deteriorate into a belfryman in another. "Youre in 4-5 ; here with me; no, slow bell now; come on, watch it. ...stand. You cant ring Stedman unless you get the leads right. Lets try it again and strike it this time." Big Johns doctrine is, up to a point, sound; Stedman goes much better when the leads are right. It goes better still when Big John remembers his Last Whole Turn. Sometimes in method ringing the situation will get out of control. A yawning chasm gapes beneath your feet. You are lost. Faced with this predicament, some belfrymen copy the eminent statesman and ring on, until they remember where they are. This is all very well with a light bell. Greater weight of metal calls for sterner measures. The principles of this will be set out in a pamphlet at present being compiled by the Belfrymanship Research Centre, and entitled "Wandering to Some Purpose," (or How to be Lost in Good Company). These are, of course, emergency tactics. For upsetting others at your leisure, one pretty little move deserves mention, here. This is the Additional Dodge Inducement. In Superlative, for example, on completing your five-pull in 7-8, you take up an attitude of expecting another dodge and then, with a deft flick strike a perfect blow in 8ths, leaving your dodging partner floundering. (Try this.) Then, at a similar position in the next course, you rub it in by remarking: "Thats the last, now down to the front." Of a well-known Midland ringer, though he has yet to acquire the title of Artful Dodger, one may well ask: "Was this the face that launched a thousand trips? On the subject of good and bad striking one embarks carefully. Among indifferent ringers it is not hard to make broad distinctions. But the more accomplished the band, the further one is driven towards the doctrine pf Mighty Willie, a prince of tenor men, if not a prolific peal ringer. Both the logic and the definition are simple. Good striking is the way I am ringing my bell, as opposed to the way the rest of the band are ringing theirs. As Mighty Willie also conducts a little, fascinating results follow. In a course of Cambridge Royal, Mighty Willie has been known to start 5-6 instead of 7-8 place, and, at the delicate hint of a few sharp growls from the tenor box, the rest of the band has obediently reverted to the previous lead en mass. To a casual observer the transition is almost imperceptible; so perfect the standard of striking. Belfrymanship revolves all the time around the subtle interplay of individual and group. The earlier article illustrated the One being welcomed by the Many. Some notes are now appended on the Many being welcomed by the One (known in some parts of the country as Yokelship or Counter-Coachtourship). The situation is easy to gauge; (a) They are in good time, have a lethargic after-lunch look, wives and children struggle in tow. Hustle them up the tower without any unction. Lock the door behind them as "we cant be too careful. About people wandering in." Or (b) They are behind schedule, aglow with the tower-snatching fever, their nerves taut and friable, to be soothed only by the sound of still more bells and the bringing round of still more methods. I insist on showing them round the church in painstaking detail. After this pleasant overture they can hardly avoid co-operating in making their stay unenjoyable. Someone is sure to want to pull the tenor up and a couple more will scamper to his aid when she proves difficult to chime. Let them sweat awhile as you slyly ignore their efforts and direct the attention of the others to the Visitors Book, before remarking, innocently, "We generally turn er when shes up: Morale being suitably deflated, announce gaily, "Well, make yourselves at home. Mind you" (going to the window), "we have to be a bit careful here, local opinion being what it is. But" (looking out, as though expecting to see an irate mob assembling in the churchyard below). "you are sure to be better than last weeks lot, as tried to ring Double Norwich." Those who had been nervously bracing themselves for a course of London are by now reluctantly deciding that it had better be Stedman - and good Stedman too - which, of course, it now has very little chance of being. Imposing Visiting Ringer: .How about having a ring with us? Modest Local Ringer: "No, you folks carry on". I.V.R. : "Believe me, were quite willing to fit in for anything youd like. I dont suppose you get much of a band locally." M.L.R. : "No thanks. I can always do a little homework." Reports are from time to time received from various parts of the country of simple and unobtrusive Belfrymanship devices, While Belfrymanship should not savour of the practical joke (being practical, but never a joke) it is thought fit at this juncture to offer a few appliances and : hints to steeple keepers and tower captains. (i). The Cynical Sally. Emits the sound. "tut-tut," when passing through the ceiling, should the ringer fail to maintain a tight rope. (ii). Gramophone record of "The Storming of the Bastille," to be played by amplifier (large) in the vicinity of the church, when a visit proves interminable or peal attempt falls below local standards of striking. When belfry funds are low, a police whistle can sometimes be made to do the trick. Alternatively, given powerful influence with the local council, a road drill may be pressed into service. (iii). Large mirrors positioned around the ringing chamber. Dodging with self and two others is great fun for strangers. (vi). Enormous diagram of unringable method on wall concealed behind a curtain, to be slyly unveiled while a difficult touch is in progress. vii). Stuffed birds in glass cases, if possible second-hand and decrepit. These successfully damp the spirit of the most enthusiastic visitor by creating the atmosphere of an indifferent Guild meeting. And now it is time for a drink, and our finest hour. The company may not have an absorbing interest in theoretical questions. They must be lured imperceptibly down the sticky road. Proceed from the known to the unknown, or rather, start with something that they ought to know (and probably dont} and so involve them in something about which they neither know nor care. Let us take, for example, the False Course Heads in Cambridge :- "Theres a point I would like to put to you." The company is politely attentive. I would value your opinion very much. You know, some of the chaps one comes across dont even understand the False Course Heads in Cambridge. Youd hardly credit it, would you?" The sickly silence that follows signifies uneasy assent. .Well now, in this little composition of mine here, Ive got a second copy. There we are now:. No, really its my turn to buy them. All right then; a brown ale." A few more minutes of this and all will be set fair for a jolly evening. Your hapless audience is soon forming a roster, taking turns to escape and prop up the bar counter for a few blissful moments before returning to the inquisition. Thats what I like about being a ringer. Its not only the ringing itself, its the comradeship. You are the Average Belfryman. Quite untrue, is your indignant protest. You like a bit of good striking; have rung a few peals, good ones; dont do much conducting, but will call if there is no one else; dont like to boast, but have taught scores of learners; no, you havent been doing much teaching lately; it is time others took a turn. Read on. This is all about you. Take the Man who is a Marvel with Learners. He gives them such confidence: .Now just take it steady. Careful not to bump the stay; its a bit weak. And remember what I am always telling you people : put some energy into your back-strokes." (Carpentry is the M.M.L.s hobby anyway.} Learners do not have ears of their own. When they have progressed a little and emerge into strange towers, preliminary advice is essential. Now shes quick at hand so you want to keep her off the 4th. And cut her in at back over the little ones, but mind the tenor, its very slow at back. And remember to hold your leads up a bit, but dont break the rhythm." As an alternative to this and equally effective: "Not an odd-struck bell among them, so we can have perfect striking, for once." The hapless Learner wishes profoundly that he had (a) put off trying Kent for another week. (b) never been born. But the M.M.L. is not typical and only a mild case. The hardened Bellfrymans attitude to teaching the inexperienced comes under Agates Law of the Non-Increasability of Nothing. They will never ring properly and he has better things to do with his time. The difference between the Ordinary Ringer and the BeIfryman is, broadly speaking, the difference between searching ones own conscience and searching someone elses. The Ordinary Ringer, suddenly realising that he is going wrong, pulls his bell in sharply. This is a sad mistake. The convulsive movement betrays him and two or three kettles are on the boil before ever the misblow sounds. Let him brazen it out and the odds are in his favour. He knows that the clash is coming and can put his word in first. A wise Belfryman reviews on each occasion his fellow-members of the band, deciding beforehand (a) those who may be hit with impunity; (b) those who must never be. hit, arranging them in priority order. Never hesitate to trample on a ringer when he is down. It cannot be emphasised too strongly that initiative is everything in Belfrymanship. One exasperating device I entitle (for want of a better name), Outployed by Matilda. You are cruising placidly along in, say, Yorkshire Major, when a shrill voice breaks in, "Missed a dodge, six." Now you are quite certain that there was no dodge. You fume inwardly and ponder a cutting rejoinder. "No, I havent," sounds pretty thin. It is all very well for Matilda with her 2 cwt. of metal. Sudden jolts round your end are more serious. That is what makes Matilda so difficult to deal with. You fume some more, (After all, this is Yorkshire, not Cambridge. Thats interesting; in Cambridge there would .be a dodge there with Matilda. Perhaps Matilda strayed into Cambridge for a moment. Yes, you will rub that in afterwards.) You fume some more. By now the ringing is in the next lead and you have missed your places. Now no one will ever believe that Matilda put you wrong. The Belfryman, of course, never goes wrong. But if you should happen to, never at all costs shed the authoritative manner. Tell a ringer, who is quite firm, what he is doing. This, for some unexplained reason, puts the onus of guilt on him. Watch Mighty Willy in difficulties: he .has missed his dodge In 4-5 coming Down and, after floundering in 2-3 for a blow or two, at last finds an opening at the Front. "Here 4, Im taking you off." And, no matter what the ensuing chaos, Mighty Willy is once again Top Man. For the man ringing a little bell, unless he is the Conductor, I know of only one redress, this .may be entitled Dunkerleys Counter. Like all effective devices it is simple. As the cyclone approaches your quarter you state quite firmly what you are doing, e.g., "Im leading now," or "Im doing Stedman Work." Others, less firm, have been swindled out of their birthright. Simple, did I say? Not altogether. You have to be sure of your work and you have to know your Mighty Willy. Important, too, is the O.K. Phrase. The O.K. Phrase (a development of Potters O.K. Word Concept) I define as the stringing together of words that sound like practical advice and are not. A particular favourite is "Steady, Two". So vague, so magisterial, so uninformative, such beautiful Belfrymanship. "Watch the leading" is a good gambit for use when there is a jumble in 5-6. For something more erudite but not as effective, "Bells in the coursing order" sounds good and can easily be justified at any subsequent inquest. Or "Lead-end coming up", "Lead-end just gone," "Half-lead coming up," "Quarter-lead coming up." It depends on the company how far you can carry this. The less expert they are the more fatuous it sounds and vice versa. Furthermore, in the stress of the moment the O.K Phrase can be complete gibberish. One protagonist of the art used, when the ringing went awry, to mouth the following O.K. Phrase, "Hives half to hawthorn finds the trick", either as a whole or a few words at a time. Since he had some idea of the Course-ends and could call Stand when he had had enough, this particular gentleman acquired a considerable reputation as a conductor in the district. Theres surely no one braver. As long as hes a Waver. I enjoy conducting Handbells. The touch seldom comes round. An obnoxious example of the Handbelfryman is Mr. Tinklejohn. Parkers Twelve-Part Peal of Grandsire Triples is a favourite of his. But on one dreadful occasion he miscalled it, Bob for Single in the 3rd Part. Like a skeleton at the feast 12345678 made an unwelcome appearance at the Part-end. Ashamed? Indeed no. With a disgusted look at the luckless rabbit ringing 5-6, "I suppose it takes all sorts to make the bells come round," he observed with grim equivocation, and cancelled the supper for four. What of those who are innocent of all this? You, who are more tripped against than tripping, take heart from a little Counter Belfrymanship. Young Joe was assistant steeplekeeper at a twelve-bell tower, where the bells were good going but difficult to hear round the front end. Many times had he suffered from visiting Belfrymen. One day a particularly obnoxious crowd was to visit the tower: Joe left the clapper-bar on the 2nd after the weekly learners practice. The visit followed its customary routine. Old Belfrymen commented that the back eight were fine, but the front four did not blend. Young Belfrymen self-importantly avowed that it needed a keen ear to pick out the light bells. Old Ebenezer, who was three parts deaf and, when in doubt, always shouted, "Keep the 2nd off at back," was in good form. Joe enjoyed every minute of the visit; he even took a turn on the 2nd himself. Afterwards, over tea, he told them. They hounded him out, of course. He was advised to give up ringing and concentrate on the choir. But the fund for recasting the bells was over-subscribed within a month. and published in The Ringing World for 1961 page 181. Or for styles that dont follow his way. Surely Birmingham ringers are grand. Theres not one that Id have in a band. Arthur Pearson, he just calls the bobs. Well, theyre only a couple of yobs. Did I say there were two lads from Handsworth? As a matter of fact there are three. Till he starts scoring peals without me. Roddy Pipes getting far too ambitious. Spliced is fine, and Im not one to nag. But whats wrong with a good peal of Yorkshire? They all count one more in the bag. Albert Walker is no good on 12 bells. Edgar Shepherds all right  with his pen. As for Haynes, he just comes when he wants to. What on earth good is twenty past ten? When the ringing is not up to scratch. Theres a London band watching the match. And his ringing shows no lack of guts. Any other bell, cant ring for nuts. And most of its far, far too slow. Where he hasnt struck one decent blow. .But theres nothing much in it for me. All those outing accounts, utter twaddle. Sunday ringers? Id give them the sack. Or, Muriel, too slow at back. And Pinfolds a left over right. The whole thing would come to a stop. While Sid Holloway just lives in his shop. Were not the experts that one thinks. If they rang nothing but Stedman Cinques. So I turned round on our great debunker. Theres not one you would have in a band? Can no one come up to your standards. The three Belfrymanship articles by Rodney seam to have inspired the following which appeared in the issue of The Ringing World dated 6 July 1956. The author is given as D. N. L. which is probably Denis Layton. A short while ago Professor Ross, of Birmingham University, published a paper in Finland on "Linguistic Class-Indicators in Present Day English." This led to a far greater general interest than one might imagine -apparently even in this politically enlightened age the aristocracy have a fascination for the mass of the population. The subject has since been taken up by several other authors, and U (i.e. Upper Class) speech and customs have been discussed at length in several of our contemporaries. These discussions have, of course, been related to social behaviour in general, Thus, it is "U " to take (not drink) tea with the milk added after the tea has been poured into the cup; dinner in U usage is an evening meal and never a midday one, and it is very non-U to have a. "sweet" as part of ones dinner - the correct word for that is "pudding." It soon becomes clear, however, to any acute observer of his fellow creatures that an analogous code of speech and behaviour is to be found among the elite in more restricted fields of activity. The art of Belfrymanship has already been described in this journal by an able scribe. It is the art by which a ringer achieves virtual supremacy over his fellows in the tower without necessarily being an outstandingly good ringer. The successful belfryman, however, is akin to the self-made man in the general social hierarchy. He is an object wonder and even, perhaps, of admiration, but scarcely one of respect. There are, on the other hand, ringers who have no need of the common ruses of the belfryman. They - it would seem -have not had to struggle to reach the summit. There is never any question of their right to inhabit Mount Olympus. When the Top Drawer was opened, there they were already (if the mixture of metaphors may be pardoned). It is not so easy to describe U behaviour in the tower as to describe the subterfuges of belfrymanship because the technique is more subtle, generally more subconsciously practised. Nevertheless, a U ringer can generally be recognised as soon as he enters the ringing chamber. His attitude is one of aloofness though not remoteness, friendliness not familiarity. He greets, in a gentle sort of way, those whom he knows and returns, quite civilly, the greetings of those whom he does know or whose names he cannot remember. On no account will he announce his identity. He only gives his name in reply to a direct (and, if his entry has been made well, almost apologetic) question, To rush cheerfully into the tower with an audible greeting to all and sundry followed by a round of vigorous hand shaking is, though much more matey, quite definitely non-U. When a touch is called for, the U response is inactivity for at least one minute, At the expiration of this period, if he has not been asked to stand in but wishes to ring, the U ringer may unhurriedly take a rope, carefully, but not too studiously see that it is not twisted, and wait for the rest of the band to fill in. On no account will he ask how his bell starts or even show the slightest doubt. If someone else asks how his bell starts he will politely tell him if he knows, or reply, "I havent got a clue," if he does not. It is, almost needless to say, very non-U to show undue enthusiasm, to ask for a particular method, to offer unsolicited advice to those who are not sure of their starts or to spit upon ones hands on catching hold of the rope. Moreover, the correct mixture of diffidence and indifference is vitally important since any appearance of being blas� immediately bespeaks the seasoned belfryman. The U ringer, though remaining a little detached from his fellows, unless they are also U, nevertheless always keeps his mind on the Job in hand and never talks while ringing. If during the touch he is shouted at by the conductor, or any other ringer, for some real or imaginary mistake, the correct action is a courteous, but completely non-committal, bow of the head in the direction of the speaker. No audible reply will be made. Should chaos occur and the touch suffer an untimely end, it is U to refrain from the post-mortem. If it is clear to everyone that the cause of the trouble was the U ringer himself, the only possible thing to do is admit the fault at once in a matter-of-fact way with just sufficient apology to make the other ringers feel vaguely uncomfortable for having let such a distinguished person get into such trouble. (This, of course, requires courage to be successful; but this quality is one possessed to a remarkable degree by all U classes everywhere and at all times.) The U ringer is, to some extent, at a disadvantage compared with the belfryman, who in the same desperate circumstances can normally adopt the principle that attack is the best method of defence. .There is also an unwritten code of U behaviour at business meetings. If it is necessary to elect a chairman because of the absence of the local incumbent and the custom for the Ringing Master not to take the chair, the most U ringer will (if he is really U) generally be appointed, and he should accept the task without displaying either reluctance or eagerness. Sometimes a mere belfryman will be elected to the chair, but no indication of shock at such impropriety may be given. Contributions to debates should be made with quiet assurance and be of such a nature, either in content or delivery, as to render further discussion unnecessary if not actually impossible. Second contributions on the same subject should not be made except, and then only rarely, to reaffirm what has already been said earlier. Points of order are raised with the chairman in such a way as to imply that, of course he (the chairman) was really aware of the point and the ringer is only lending moral support to action which the chairman has already decided upon. .It may seem to some readers that U behaviour is merely Belfrymanship writ large, but even they must surely admit that it is also written much more delicately. The two, however, really do differ in their nature. The U ringer is generally something of a stylist and a perfectionist (qualities which may be regarded as necessary but not sufficient), and is frequently though not always a proficient method ringer or conductor. The Belfryman, on the other hand, too clearly achieves his eminence by conscious effort. Any sensitive ringer realises that U; in the belfry tends to add dignity to the proceedings and stability to the organisation. The following article by Stephen Theobald was first published in the Surrey Association Newsletter and republished in The Ringing World dated 22 February 1991. It is essentially a summary of the Belfrymanship articles. Belfrymanshp is all about becoming the "Top Man" in the tower. In this position. other ringers will look to you and be inspired by you. The Tower Captain will come to trust and respect you. Bclfrymanship, therefore, is the art of becoming the most confident and charming, but also the most influential and revered ringer in the belfry. With this aim in mind. this article should help prospective Belfrymen to achieve their goals. Let us consider first of all. the Belfryman's entrance into a strange tower. The welcome is nearly always courteous: "What would you likc to ring". Establish your position immediately with a well-chosen reply: "Well, I know a good touch of Belfast...", or "I am happy to ring rounds, as long as they arc well struck..." (You know full well that for some reason they seldom are). This draws attention to your superiority at once and puts you "one up over the Tower Captain. When selecting your bell to ring in a touch be sure to choose a heavier rather than a lighter bell. Therc is a theory that little bells should "ring round" the larger ones, and hence the ringers of the little bells will inevitably be blamed for indifferent striking. in the absence of any other obvious cause. Good striking is a matter of cohesion and mutual confidence within the band. Personalities only become dominant during the fire-ups. It is important for the Belfryman that no other personalities are visible except for your own, so when calling a touch and the ringing becomes at all shaky, hasten the process by rasping in the most vinegary tone you can muster, "Listen to the striking!" This commits you to nothing but the effect can be devastating. The touch will deteriorate rapidly to a point where you can safely shout "Stand" with no fear of being accused of setting up the touch too soon. For defensive purposes, an impassive countenance should be cultivated. When ringing on the larger number of bells, say Stedman Cinques, and large gaps start appearing in the rows because of missing bells, then it is time to act. "Youre too high", is a fair sounding piece of useless advice, and is often enough to upset the conscientious dodger who knows exactly where he should be but has no one to dodge with. This induces panic and adroitly shifts the blame away from yourself when trouble threatens. Never forget though, that the Belfryman best defends by attacking. Useless advice also functions as well in an offensive mode too, and is especially useful in a Belfryman versus Belfryman conflict. If you are faced with a tough adversary who persists in keeping right. Tell him something that he obviously knows already such as "You're sixths place bell", or "Last whole turn now". Whilst racking his brains for a suitable retort he will probably fall off his line, and you can tell him what he should be doing, blow-by-blow, for the rest of the touch. Gesticulations can also emphasise "natural" superiority. The subtle stretching out of the arm and making slight but majestic waves up and down with the palm of the hand upward indicate to the target ringer opposite you that he is clipping your bell, and that his inability to strike properly is both audible and painful to you. The victim has no redress. In order to retaliate and return a gesture to you he may accidentally let go of the rope, or let his bell slip-wheel. Either way, you will have scored another victory. Belfrymanship is, of course, not only confined to the ringing chamber. In pubs and clubs, at parties and Midsummer Suppers, the Belfryman should keep on top of the discussion. The Belfryman should voice his opinions on controversial matters such as how to call long length quarter peals of Erin Caters, on the ethics of ringing peals "for fun", and on the threatening "masculinity" of female District Masters. Technical terms should be thrown into casual conversation at convenient intervals to liven up the debate. A discussion on the mathematical beauty of "Q-sets", or how to compose peals for methods with group B falseness will silence all but the most talkative ringers, leaving the stage free for you to air your own pet views. The budding Belfryman should be aware of all these techniques, but these few ideas are by no means a complete collection. Indeed, the successful Belfryman will develop his own strategies on the basis of trial and error, and with a combination of patience and perseverance will ultimately achieve the supreme accolade of "Top man".